TEHRAN, Iran (AP) — The halls of the former prison in the heart of Iran's capital now are hushed, befitting the sounds of the museum that it has become. Wax mannequins silently portray the horrific acts of torture that once were carried out within its walls. DUBAI, United Arab Emirates (AP) — Mourners tossed flowers from a helicopter and a ferry into the Persian Gulf off the coast of Iran on Tuesday to mark the 30th anniversary of the U.S. Navy shooting down an Iranian commercial airline, which killed 290 people. TEHRAN, Iran (AP) — Hundreds of thousands of Iranians rallied on the streets Sunday to mark the 39th anniversary of the 1979 Islamic Revolution, just weeks after anti-government protests rocked cities across the country. 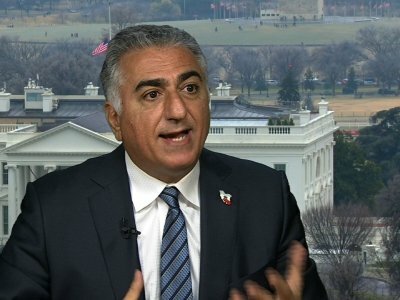 WASHINGTON (AP) — Reza Pahlavi concentrates intently on the little cellphone in his hand, scrolling through clips of chanting Iranians and explaining why the protests unsettling his homeland are different this time. Even as the latest reports suggest the unrest may be ebbing, the scion of Persia's 2,500-year-old monarchy believes Iran's people are writing a new future for themselves, and perhaps for their exiled son. TEHRAN, Iran (AP) — Iran is rejecting speculation that a possible release of a detained British-Iranian woman is tied to a "swap deal" involving 400 million pounds ($530 million) held by London, a payment the late Iranian Shah Mohammad Reza Pahlavi made for Chieftain tanks that were never delivered. TEHRAN, Iran (AP) — Iran on Saturday displayed a surface-to-surface missile as part of events marking the anniversary of the 1979 U.S. Embassy takeover and hostage crisis amid uncertainty about its nuclear deal with world powers. Thousands gathered at the former U.S. embassy in downtown Tehran where a missile, believed to be a 2,000-kilometer (1,243-mile)-range solid-fuel Sejjil, was on display. It was the first time Iran displayed a missile during the annual gathering. DUBAI, United Arab Emirates (AP) — President Donald Trump's decision to not re-certify the Iranian nuclear deal marks yet another key moment in relations between Iran and America, which has seen decades of mistrust and mutual recriminations. Iranian President Hassan Rouhani mentioned many of them in his reaction to Trump's decision Friday night. DUBAI, United Arab Emirates (AP) — Iran's exiled crown prince wants a revolution. TEHRAN, Iran (AP) — Iran's president said on Tuesday that his country will not allow incoming U.S. President Donald Trump to "tear up" Iran's landmark nuclear deal with world powers and also warned Tehran will react to any extension of American sanctions. TEHRAN, Iran (AP) — Thousands of Iranians have burned the American flag and chanted anti-U.S. slogans as they marked the anniversary of the seizure of the U.S. Embassy in Tehran by militant students 37 years ago. Such protests take place every year outside the compound that once housed the embassy on the anniversary of the 1979 takeover that followed the Islamic Revolution in Iran.